← The Car is Sold! – 20 days before departure. A Safe on the Boat? I did not realise that there was a safe fitted to the boat. Checking through the bilges, I came across it and I thought that it would be good security to use it when abroad. The next question, how could I open it? Talking to the previous owner, he knew it was there but he never had the keys. 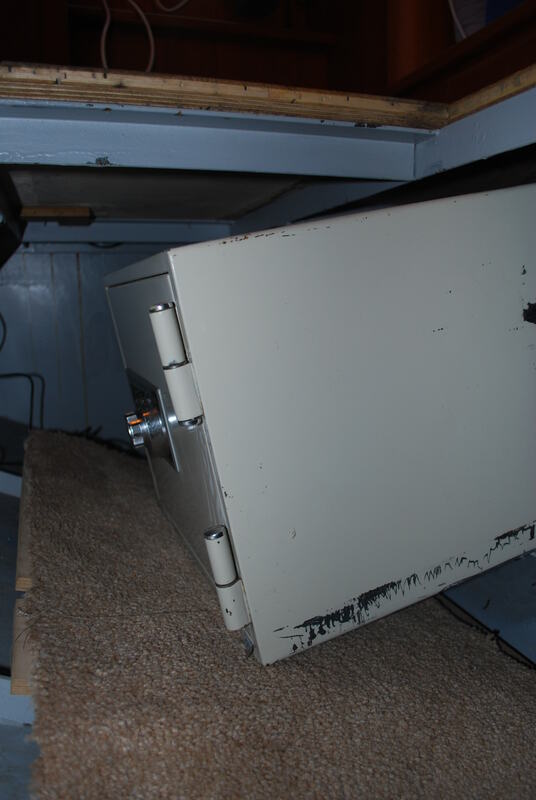 That meant that since at least 2001, the safe had never been opened. We contacted the agents for the safe in Ireland but the cost of getting them to come and check out the safe would have been more that the cost of purchasing a new safe. At that point, I had more or less decided to give up on the idea . 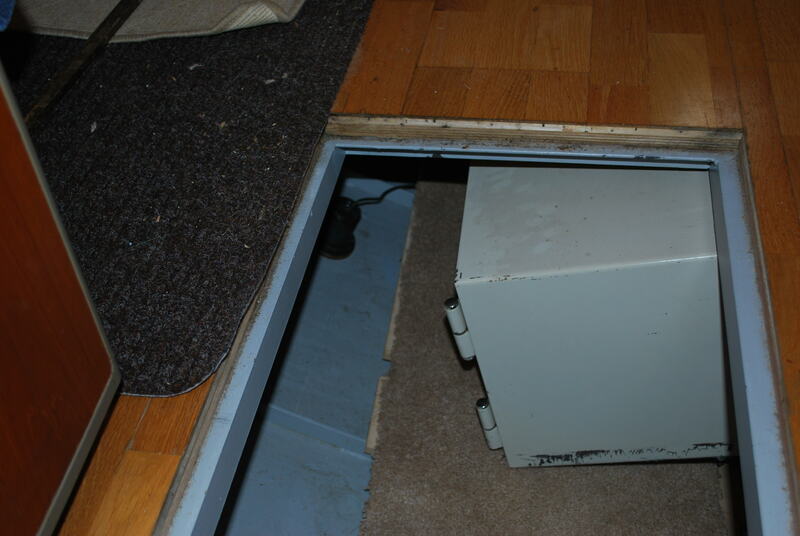 Boy did we struggle to get the safe out of its frame in the bilges. It nearly beat us. We finally got it out but it has lots of dents and scratches from the crow bar and hammer we used to get it out. Off went the safe in the back of a van and low and behold it came back two weeks later with two new keys and precise instructions on how to work the complicated combination lock. Price for all the work –two bottles of good Irish whiskey! I have now reinstalled the safe (and I am not going to show where in the photos). I was advised by my new found friends not to show photos of the front of the safe ( so note the angle of the photos). I asked did they find anything in the safe when it was opened and was told definitely not, that even the wrapping plastic was still on the shelves! But I don’t know – that safe had been locked for a very long time and the boat came from Holland and the Euro started in 2002. Maybe it was filled with drugs and Dutch Gilders! I will be watching my friend carefully in case he buys a farm or a top of the range sports car!! 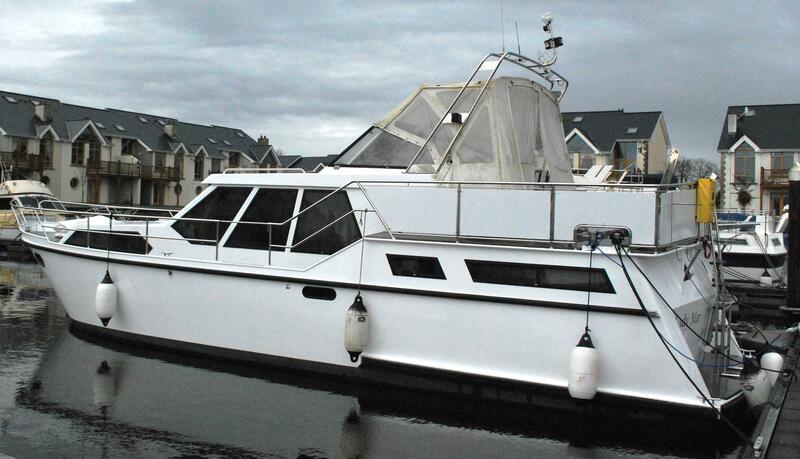 This entry was posted in C'est La Vie - The Boat, Getting Ready for Gap Year. Bookmark the permalink.